Bernie Faloney (June 15, 1932 – June 14, 1999) was a professional football player in the Canadian Football League (primarily with the Hamilton Tiger-Cats) and an outstanding American college football player at the University of Maryland. Born in Carnegie, Pennsylvania, Faloney is a member of the Canadian Football Hall of Fame, Canada's Sports Hall of Fame, the Pennsylvania Sports Hall of Fame, the Western Pennsylvania Hall of Fame, and the University of Maryland Athletic Hall of Fame. Faloney's jersey #10 was retired by the Hamilton Tiger-Cats in 1999. In 2005, Faloney was inducted into the Ontario Sports Hall of Fame. In 2006, Faloney was voted to the Honour Roll of the CFL's Top 50 Players of the league's modern era by Canadian sports network TSN. B.J. "Bernie" Faloney was born in Carnegie, Pennsylvania, where he played high school football before attending the University of Maryland, College Park. There, he played college football as a quarterback, helping the Terrapins make it to the Sugar Bowl in 1952. In his senior season of 1953, Faloney quarterbacked Maryland to be NCAA Division I-A national football champions and into the 1954 Orange Bowl. At season's end, Faloney finished fourth in the balloting for the 1953 Heisman Trophy. Faloney was drafted in the first round of the 1954 National Football League draft by the San Francisco 49ers. San Francisco offered Faloney $9000 to play defensive back and back-up quarterback. However Pop Ivy, coach of the University of Maryland's Orange Bowl opponent, Oklahoma, was moving to the Edmonton Eskimos of the Canadian Football League and offered Faloney a $12,500 contract to accompany him. At the time the Canadian dollar was worth 10 per cent more than its American counterpart so the choice to head north was easy, Faloney later recalled. A scrambling quarterback, Faloney helped the Eskimos win the 1954 Grey Cup but then fulfilled his mandatory service in the United States armed forces, serving with the U.S. Air Force from 1955 to 1956. A free agent after his military service, Faloney signed with the Hamilton Tiger-Cats in 1957 and became one of the major stars of the Canadian Football League, winning two Grey Cup championships with the Ti-Cats. Traded from Hamilton in 1965, he played for the Montreal Alouettes and the BC Lions before retiring in 1967. 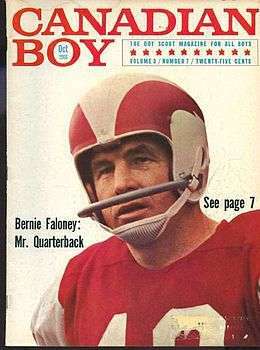 Faloney was the Eastern Conference's All-Star quarterback on five occasions, 1958, 1959, 1961, 1964 and 1965. In 1961, he won the CFL's Most Outstanding Player Award. His career CFL stats include 1,493 pass completions of 2,876 attempts for 153 touchdowns and 24,264 yards. He still holds the Grey Cup record for most passes completed and most touchdowns. He is the first CFL quarterback to win a Grey Cup championship with both Eastern and Western Conference teams. Bernie Faloney was inducted into the Canadian Football Hall of Fame in 1974, the Western Pennsylvania Hall of Fame in 1983, the Pennsylvania Sports Hall of Fame in 1985, the University of Maryland Athletic Hall of Fame in 1988, and Canada's Sports Hall of Fame in 1999. In November 2006, Faloney was voted to the Honour Roll of the CFL's top 50 players of the league's modern era by Canadian sports network TSN. In retirement, Faloney made his home in Hamilton, Ontario where he became a part owner of a construction company. An avid horseman, he remained active in community and business affairs until being stricken with colorectal cancer. Faloney died on June 14, 1999, in Hamilton, Ontario. Cannon Street in Hamilton, Ontario, in the Brian Timmis Stadium and Ivor Wynne Stadium area is also known as Bernie Faloney Way. 1 2 Brunt, Stephen (1999-06-15). "A great athlete, a great citizen and a storied Tiger-Cat legend". Canada's Sports HOF (originally appeared in The Globe and Mail). Retrieved 2007-05-05. 1 2 "TSN Top 50 Honour Roll". TSN.ca. 2006-11-28. Retrieved 2007-05-05. ↑ "Honoured Members: Bernie Faloney". Canada's Sports HOF. 1999. Retrieved 2007-05-05. ↑ "Info Please: Bernie Faloney". Retrieved 2007-01-26.